On Monday morning during WWDC’s keynote, Apple CEO Tim Cook revealed new enhancements to iOS 9, calling it “the world’s most advanced mobile operating system.” Among the key features are a major Siri update, deep-dive transit Maps, and a ton of useful user-experience improvements. According to Craig Federighi, Apple’s senior vice president of Software Engineering who led the iOS presentation and demo, Apple wanted to add “intelligence throughout the user experience” in iOS 9. 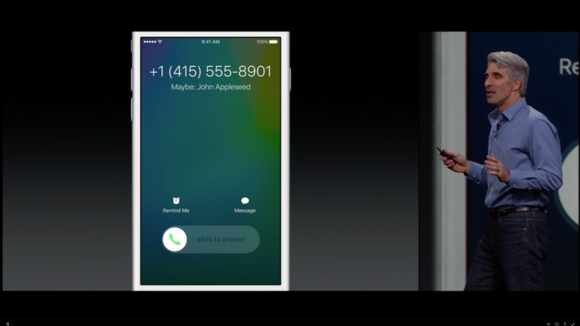 In iOS 9, Siri can pull up photos and videos stored on your device. More impressively, Siri becomes a smarter assistant by looking at how you use your iPhone at any given moment and recommending ways for you to use it next, interpreting natural language into commands. For example, when you’re looking at a webpage on Safari, you can create a Siri reminder by saying “Siri, remind me about this later,” and Siri will then refer back to the webpage you are browsing. Furthermore, Siri has become a “proactive” assistant that analyzes information about your daily habits, taking into account your location, the time of day, the app you are viewing, and what other devices you have connected—all in order to better anticipate your next move. When you plug in your headphones, for example, your iPhone will launch your Music app and display your most recently listened to track right on your lock screen. And when you connect your iPhone to your car, Siri will suggest the audio book that you’ve been listening to on your commute every day. (Apple didn’t specify if a CarPlay-connected vehicle was required for this feature, but it seems likely.) This new, more intelligent Siri also takes event invites you receive in Mail and automatically creates events in Calendar. 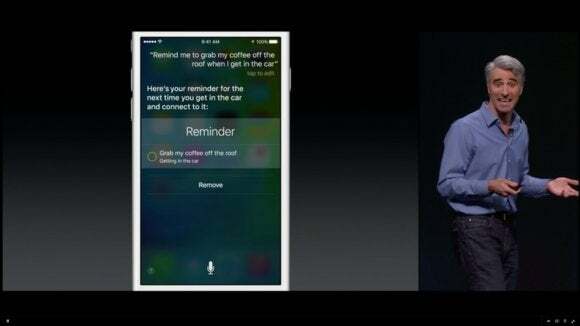 In addition, Siri takes into consideration other information from native apps. For example, when you receive a phone call from an unknown number, Siri will go through your Mail and Contacts to try to decipher who might be dialing you on the other end. 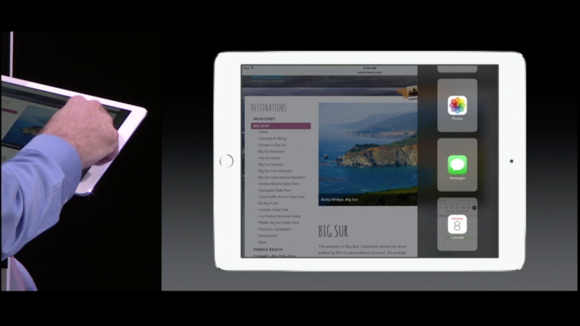 Searching in iOS 9 will also be more efficient, thanks to a new and improved Spotlight. Spotlight will support video search from Vevo, Vimeo, and YouTube, and you will be able to play videos directly from the search results. A new Spotlight search API will also allow developers to yield search results with deep-links to their app. Using Spotlight to search for a recipe, for example, will surface search results from food recipe apps and take you right to the appropriate recipe within the app. iOS 9 replaces Passbook with Wallet, a new native app that will store your Apple Pay information as well as credit and debit card information from your bank and rewards cards from various retailers. Apple Pay will launch in the U.K. in July, and already has several thousand partners on board—including London’s public transportation system. Avid note-takers will have an easier way to jot down their thoughts using Notes. In iOS 9, Notes supports graphical links and a quick way to turn your notes into interactive to-do lists where you can check off various tasks. 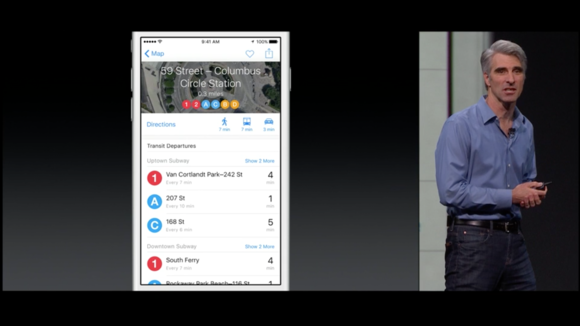 Apple Maps will finally support transit directions and full-featured transit maps, launching with iOS 9 as well. To start off, Maps’ mass transit service will be available in 10 major cities: Baltimore, Berlin, Chicago, London, Mexico City, New York, Philadelphia, San Francisco, Toronto, and Washington D.C. Apple surveyed individual public transportation stations to compile its own transit data to make Maps as accurate as possible. In iOS 9, Maps will also incorporate more information from local businesses, including whether or not they accept Apple Pay. Another native app switch-off, News will replace Newsstand. News is a customizable digital magazine, and Apple recruited publishers like The New York Times, ESPN, and Conde Nast to create an interactive reading app. News showcases content from these publishers in a beautiful interface that can play slideshows and video. For the iPad, iOS 9 brings new features to make it easier to compose and edit text. The QuickType keyboard improves the suggestion bar by adding shortcuts so that you’re able to format text and access attachments in a seamless way. The one key feature of QuickType is the ability to turn the iPad’s touchscreen into a trackpad by simply putting two fingers down on the screen and dragging selected text around. iOS 9’s new Slide-Over feature is another iPad-only enhancement aimed at productivity, allowing you to work within two apps at the same time. This secondary app launches along the right-hand side of the iPad, and gets pinned to the side regardless of which app you open to be your primary app. For example, you can browse Safari and use Notes simultaneously, pinned as a slide-over app on the side. Another cool feature of Multi-Tasking on the iPad is picture-in-picture. If you’re watching a video but want to access another app, you can minimize the video screen, resize it, and drag it to another place on screen, which allows you to keep an eye on the video while using another full-screen app. You can even move it all the way to the side of the iPad, just out of view, if you just want the audio playing but have to do work on another app. Of course, iOS 9 ushers in several all-around improvements and fixes, too. For example, a new low-power mode “pulls levers you didn’t even know existed” (according to Federighi) to extend battery life by three hours. And to beef up security, Apple is introducing two-factor authorization on-device and on the cloud. iOS 9’s developer beta is available today, and its public beta will be available July. The full version will be released to the masses as a free upgrade this fall.